The images and designs of open space shown for the site are conceptual only. Detailed design of park and open spaces will occur during the developer’s master planning process, in consultation with the City’s Parks Department and public stakeholders. Following the City’s parkland dedication ordinance, the City can only legally require 9% of property to be designated specifically as parkland during rezoning, though a developer could decide to build more parkland than required by City ordinance. Additional land can be set aside for stormwater treatment (with park-like qualities) and public right-of-way (roads and sidewalks) in addition to the 9% parkland dedication ordinance. Additionally, the City is supportive of efforts by private groups to secure space on-site for future recreation fields, like the Little League baseball fields that exist on the site today. A prominent water feature will run through the site from north to south, serving both as a public amenity and as a stormwater management system. Capitol Region Watershed District and the City of Saint Paul completed a Sustainable Stormwater Management Study in 2016 to enhance potential outcomes for stormwater infrastructure on the Ford Site. The study lays the groundwork for future stormwater infrastructure, with one of the goals being to “daylight” Hidden Falls Creek in Saint Paul’s Highland Park neighborhood, identified as a priority in the City’s adopted Great River Passage plan. 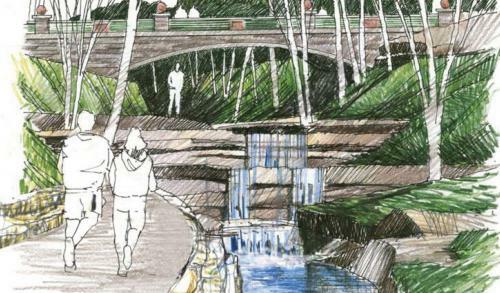 The Ford stormwater infrastructure plan outlines transformation of the site by featuring a stormwater-based amenity for the community that reconnects the community to parks and the Mississippi River. The City is actively looking at innovative approaches to stormwater management on a variety of sites throughout the city, with Ford Site redevelopment being a clear opportunity to consider a district-wide approach.